1LT Jesse Hardy, the 3-19th ADT Platoon Leader, engages in a friendly soccer volley with Gharghash High students. Roughly eight weeks ago, a stable of horses here in Khowst Province was led to the nearest watering hole in an effort to teach them how to drink. During a recent visit to that watering hole, members of the 3-19th ADT were delighted to find that not only were the horses hydrating plentifully- they were also bottling some of the nutrient rich liquid in an effort to share it amongst other steeds who might not ever get the opportunity to travel to the source. 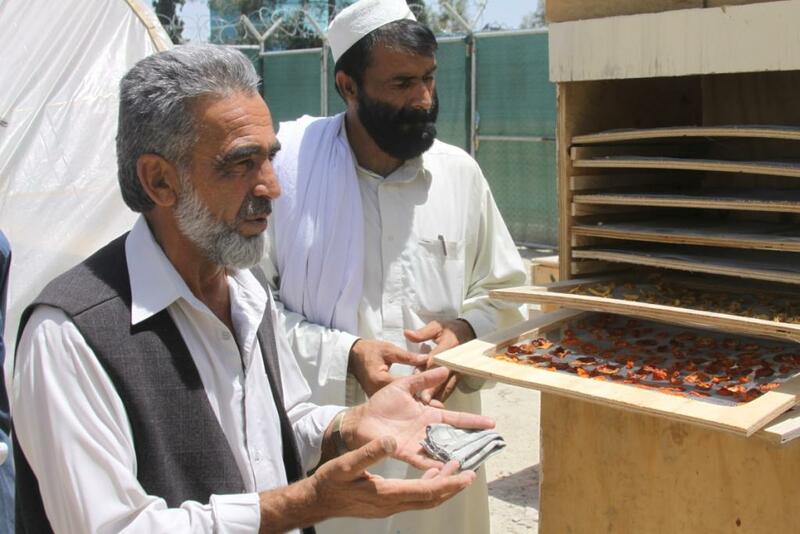 If you've read this blog in the past, you're well aware of our Future Farmers of Afghanistan project. The initiative, designed to aid in leadership development among Afghan youth, is proceeding better than many of us could have ever envisioned. The six high schools chosen by the Director of Education to serve as pilot sites across the province are all currently in the mentorship phase of the program. During this portion, agricultural faculty from Shaikh Zayed University along with the local agricultural extension agent, spend four hours per week at each of the six schools. Our most recent quality assurance visit, a May 21st trip to Gharghash High School, was by far the most inspiring check-in to date. With only a few hours notice, the school's principal- Ajap Pan, agreed to meet us during the rotation period surrounding lunch, where the morning students begin their journey home and the afternoon pupils arrive hungry for knowledge. 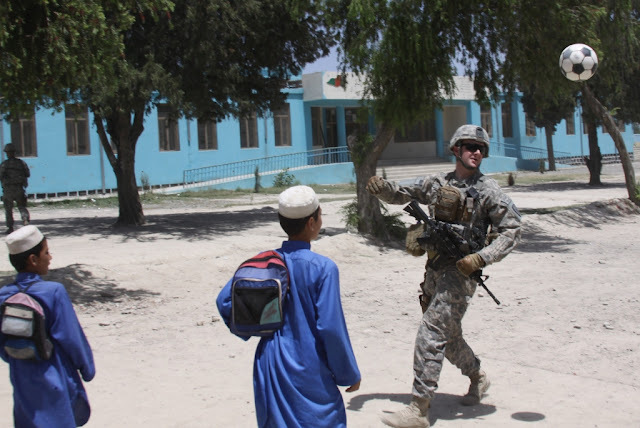 As we first arrived the school, Major Jeremy Gulley- an Education Officer on the team and Principal of Huntington North High School back in the civilian world, greeted the Gharghash High School Principal. 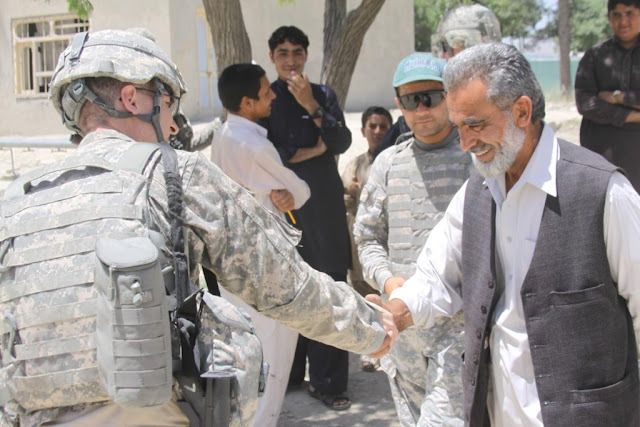 Before our interpreter could even finish his translation, the smile across the Afghan Principal's face exuded his delight in knowing that he was conversing with a fellow educator. This is another great example of why Agribusiness Development Teams are such an anomaly amongst military units. How often do you see a high school principal leaving his suit and tie at the dry cleaner for a year, only to throw on his camouflage fatigues? 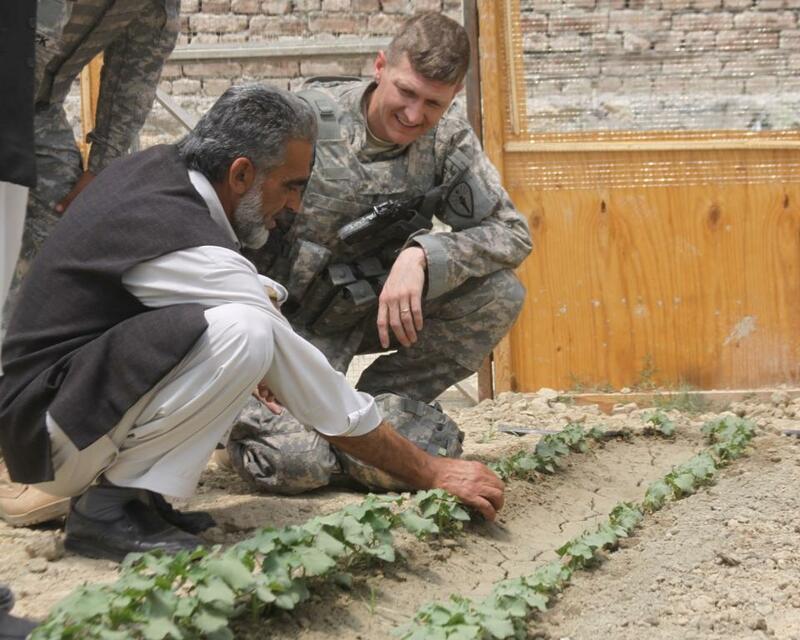 A popular past time for children across the country of Afghanistan includes asking service members for pens. "Qalam? Qalam?" is a frequent request of most every child you meet while out amongst the population. Just as their counterparts in the United States, behavior levels among students vary quite drastically as you travel the province. As some young men will literally steal the pens out of your pocket, it is critical to keep anything of value out of sight from these kleptomaniacs. ﻿﻿After speaking with the principal in the courtyard, our group moved into the agricultural portion of the school grounds. In an effort to cut down on pedestrian thru-traffic and vandalism, each of the agricultural kits are fenced off into a private area. 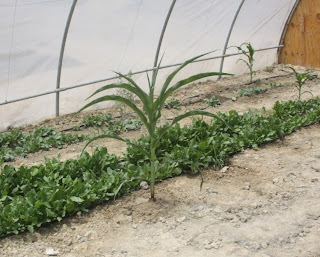 Upon entering the green house, the most welcoming site was that of a few lone stalks of corn. While these weren't strategically planted, I do think the Gharghash gardeners knew this would be a quick way to get onto a group of Hoosiers' good sides. Among the other crops we were delighted to see growing in bounty included "lady-finger" okra, spinach, and cauliflower. One issue that schools have noted within the original design of the greenhouse is the lack of ventilation. After the initial construction of the project kits, the schools took full ownership of the sites and were free to do as they saw necessary to ensure a functioning agricultural environment. One of the first things Gharghash leaders did was arrange for ventilation screens to be cut into each end of the greenhouse. 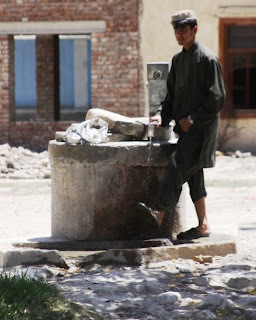 This kind of improvisation is encouraged as a part of the Future Farmers of Afghanistan project, as a sort of field-expedient problem solving. This is also inspiring to think of in terms of the sustainability of these agricultural kits. When the United States is long gone from Afghanistan, young men and women who are confident in their skills will have the mental capacity and experience to act on an issue, whenever and wherever those issues will inevitably arise. After our sultry (102 degrees outside made for 120+ inside) visit to the greenhouse, the next order of business called for a stop at the solar dehydrator device. Gauging by the amount of sweat rolling off our bodies, I think the greenhouse could have easily been labeled a solar dehydrator as well.As we approached the dehydrator, the excitement and pride in Principal Ajap Pan's voice was unmistakable. Opening the latch that secures the exterior flap to the base of the device, Pan revealed to us a textbook example of dried fruits and vegetables. Several screens filled with apples, tomatoes, and apricots lined the shelves of the dehydrator; just as Pan and others were taught eight short weeks ago during their training course at Shaikh Zayed University. Before we departed the school grounds, Major Gulley congratulated his fellow Principal once again for a job well-done, so far. He stressed to Ajap Pan the importance of always having the agricultural area prepared for visitors. As the Future Farmers of Afghanistan project continues to attract attention all the way up both civilian and military chains of command, many high-profile visitors have inquired about the program and expressed interest in paying a visit to one of the six pilot schools. There is a very good chance that the Governor of Khowst Province, Abdul Jabaar Naeemi, will be touring one of these sites in the very near future as well. Another issue we discussed with Principal Pan that was dear to my heart was the sale of goods grown inside the greenhouse or from the solar dehydrator. I was ecstatic to learn that eggs layed in the poultry coop had already been sold at a local bazaar, with the profits reinvested into the upkeep of the farm. The sale of products produced on the farm will not only give students a wonderful experience in marketing, but also ensure that the farm is around for decades to come. To see that the horse we led to water drank voluntarily, was a very rewarding experience. We're all very well aware that only the Afghan people can ultimately decide what the future of their country looks like. We on the 3-19th ADT will have the satisfaction of knowing, in our short year on the ground here in Khowst, that we planted the seed for invaluable youth development and leadership programs. 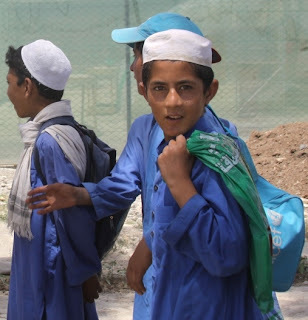 The future is wide open and based on a plethora of variables, but if other provincial schools are able to model the initiative those at Gharghash High School have taken; rest assured that the Future Farmers of Afghanistan will continue to play a major role in the development of this country's next generation of leaders. zeros in their budgets; part ways after a May 21st visit to Gharghash High School in Khowst Province. Sounds like you made that little boy's day! It's amazing how something we see and use every day here can make a day over there. Once again, so inspiring and fascinating to hear what you guys are doing over there. Keep up the awesome work and thank you!